In 2015, the global video games market was worth approximately 71 billion U.S. dollars. By the end of 2020 its value is expected to exceed 90 billion U.S. dollars. The gaming software industry depends on three monetization models to make such profits: consumers may simply buy games; revenues can be generated via in-game advertising; or gamers spend money on micro-transactions. Each of these models can be exploited individually; however, in many cases gaming companies choose to combine at least two of the three models to boost income prospects. The combined models function mostly in free-to-play (F2P) games, where gamers are encouraged to pay for enhancements, such as additional lives, currency, personalized avatars, an ad-free experience, or unrestricted playing time. Those playing for free may face in-game advertisements, timers, a lack of customization options, or other annoyances. In the United States the average annual expenditure on gaming software in 2016 amounted to approximately 11.38 U.S. dollars per consumer. It is estimated that roughly 60 percent of gamers in the country own between one and ten paid PC games, paid console games, or paid mobile games. On the other side, recent calculations indicate that consumer spending on in-game purchases will grow from 22 billion U.S. dollars in 2015 to 32 billion in 2020. In 2016, more than a quarter of gamers in the United States admitted to purchasing such additional video game content. The majority of those transactions were worth between one and 20 U.S. dollars, while 11 percent of U.S. gamers claimed to have spent more than 250 U.S. dollars on in-game purchases. 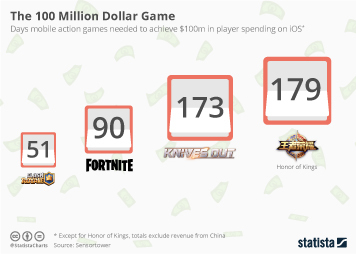 In terms of specific models used in mobile games, in-app advertising is the prevalent choice among developers, as roughly 70 percent of Android and 80 percent of iOS games used this monetization method in 2017. The second most used model was microstransactions. Among mobile games which relied on advertising as their primary revenue source, the most widely used advertising SDKs were AdMob, Chartboost, and Unity Ads. As mobile gamers tend to prefer ad-supported but free games, it comes as no surprise that 67 percent of games in Google Play Store were utilizing this model. Also, nearly 60 percent of iOS games contained advertising, as opposed to 40 percent that did not rely on in-game advertising at all.